Violin Outlet offers a great rent-to-own program based on the philosophy that the customer should be able to rent quality instruments at affordable prices and accumulate as much equity toward purchase as possible. Currently we are able to rent to customers living locally in the greater Las Vegas area including North Las Vegas, Henderson, Pahrump, Logandale, and Boulder City. What to consider when renting? 1.) How much will it cost me if I decide to purchase an instrument? At Violin Outlet we do not believe in inflating prices or charging interest. All of our instruments are priced fairly. We even offer a discounted price for early purchases. 2.) How much of my monthly rent actually applies toward the purchase of an instrument? At Violin Outlet 100% of all your rent may be applied toward the purchase of an instrument. 3.) How much is the rent per month? At Violin Outlet we rent violins from $15.00 per month, violas from $20.00 per month, cellos from $30.00 per month, and basses from $50.00 per month. We rent both new and used student instruments. 4.) What if I need to switch sizes? 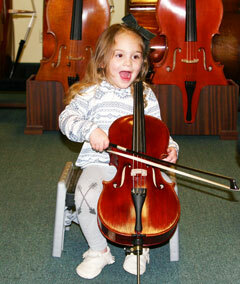 At Violin Outlet switching the size of your instrument is an easy process. You simply pick out another instrument and keep renting and accumulating your equity toward purchase. 5.) What if I decide that I do not like the instrument that I am renting to own? 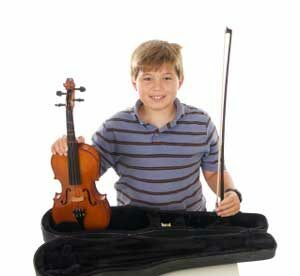 At Violin Outlet you may switch to any instrument of equal or greater value at any time. 6.) What if I decide that I want to buy an instrument, but not the one I am renting? At Violin Outlet all of your rent will be applied to any instrument of equal or greater value. 7.) What if the instrument gets damaged or stolen? At Violin Outlet we offer optional coverage for loss of, damage to, and repair of each violin, viola, and cello. The cost is $5.00 per month for violins and violas and $6.00 per month for cellos. 8.) What if I decide I do not want to continue renting? At Violin Outlet you may return the instrument at any time after the first three months with no penalties. 9.) What do I need in order to start renting? At Violin Outlet all that is required, upon approved credit, is a valid ID, refundable deposit ($25.00 for violin, $30.00 for viola, $50.00 for cello, and $100.00 for bass), and a Visa, MasterCard, or Discover credit card or debit card to secure your rental. You can be out the door with your rented instrument in minutes! 10.) Is this the kind of store I would like to do business with? At Violin Outlet we strive to provide the best service possible. We guarantee that all our instruments are properly adjusted in our repair shop to meet or exceed Clark County School District standards. We specialize only in stringed instruments and all our regular employees are proficient on at least one stringed instrument. Feel free to ask for a demonstration. Ready to start renting? Give us a call!